Power - Control - Flexibility - The XJ-1000FR is the flagship of the XJ series. Featuring advanced patented Class J output technology, full PC interfaced DSP engine, OMEGA control, VE-TAT acceleration and MARS protection - all in a cool running 1U form factor. 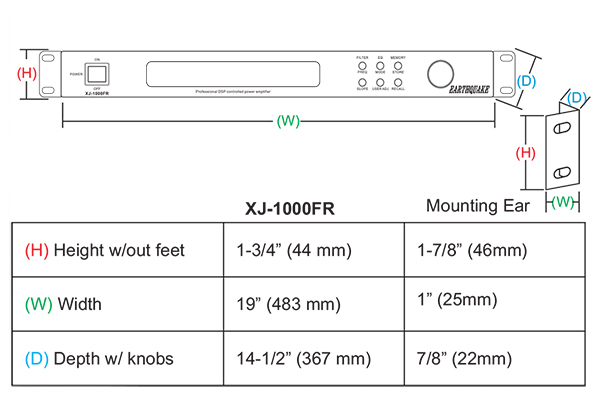 Envisioning the XJ-1000FR - Earthquake’s chief engineer Joseph Sahyoun wanted to create an amplifier equally excellent at any amplification task. The XJ-1000FR has the muscle to challenge even the largest speakers. All this power is at the users absolute control. Just plug the amplifier into a PC/MAC's usb port and every parameter of operation becomes accessible. Computerized DSP - it's your signal, shape it the way you like! Every imaginable filter and EQ combination at your fingertips: Variable LPF (low pass filter), HPF (high pass filter), Definable subsonic filter in 1 HZ increments, programmable 30-band equalizer and six preset equalizers - flat, music, movie, dynamic, impact. Audio delay in degrees and milliseconds and the ability to save multiple profile-settings and recall them when needed, are useful features when using the amp for various tasks. Control the amp via front panel switches, a full featured remote control, or with a PC/MAC. Complete easy to use software package included. 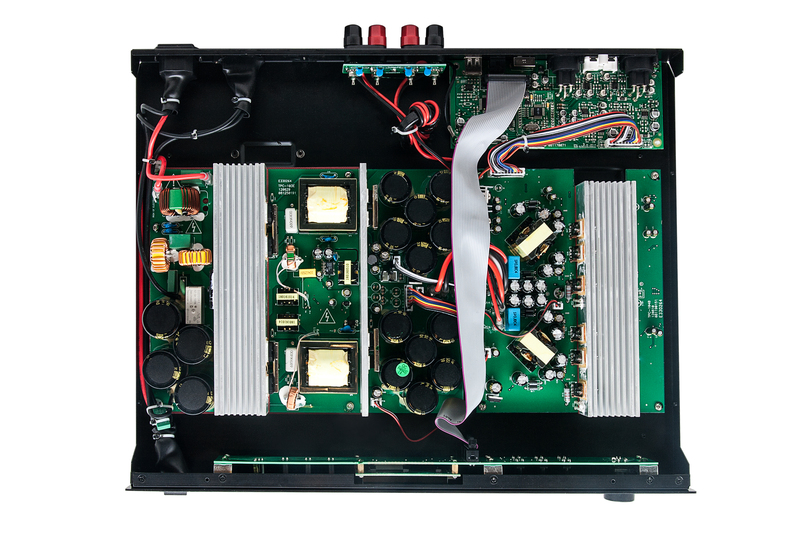 OMEGA (Optical Multilevel Empirically Guided Aggregation) is the highly evolved brain and central nervous system of the XJ1000FR amplifier. Traditional amplifiers are comprised of many circuits, operating in blind autonomy. OMEGA adds intelligence and operational awareness to these functions- transforming autonomy into unity. OMEGA is tapped into every circuit and transmits instructions in the optical plane with a speed more than 1500 times that of the fastest signal passed through the amplifier. This enables constant optimization of power generation and amplification. The best example of efficiency gain due to OMEGA is the power supply and amplification section, previously operating without coordination. With OMEGA - they operate in continued adaptive synchronization, almost doubling their output. In addition to adaptive synchronization, OMEGA utilizes an optical multilevel feedback path operating in the digital domain providing real time targeting data. This enables OMEGA to digitally steer voltage and current with absolute precision. 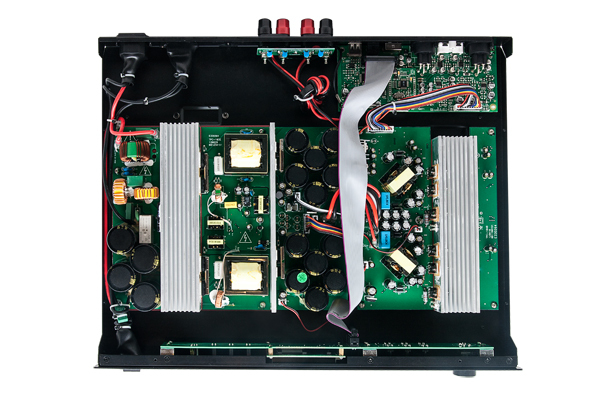 The patented Class J output stage ensures stellar audio quality and adds to the advances in efficiency accomplished by the OMEGA technology.Class J takes the concept of the “intelligent circuit” a step further by actually adapting the electrical operation of the output stage to the signal it is playing. This can rightly be considered a quantum leap in amplifier technology. The revolutionary aspect of Class J is its ability to combine ultra high efficiency of 99% with extraordinary bass control. Class J is an evolution on PWM (Class D) technology that combines advanced multi-level digital feedback with an intelligent controller. It modulates the supply voltage and output switching frequency in real time based on the frequency and amplitude content of the input signal. This added level of intelligence offers several advantages such as increased thermal headroom, dramatically improved bass response and dynamic power capabilities. VE-TAT (Velocity Enhancing Transistor Augmentative Technology) is an enhanced transistor dead-time controller. Where OMEGA is a macro overlay system and Class J is an intelligence infused output topology, VE-TAT works at the component level. A critical area for efficiency in a PWM (switching output) amplifier is the speed and precision by which the transistors can be opened and closed. VE-TAT dramatically increases transistor velocity thus eliminating dead-time losses and increasing efficiency. The addition of VE-TAT makes the Earthquake Gen 4 Class J output topology the most efficient amplification technology on the planet today. MARS (Magnetically Actuated Reanimation System) is a new type of protection system that enables the use of all amplifier power resources without compromising the survivability of the amplifier under catastrophic conditions. Typical protection systems rely on fuses or relays that complicate the signal path thus degrading audio quality. MARS is different as it is not in the signal path, but works by sensing the electromagnetic field of the conducting wires. Like OMEGA the internal communication of MARS is optical rather than electrical. MARS does not use any relays or other damping-factor reducing mechanical switches that can wear out or fail over time. Instead, a specially designed circuit instantly shuts off the output drive. In the event a short-circuit activates the MARS protection system, it continuously re-scans the output every 10 seconds. Normal operation automatically resumes as soon as the short-circuit condition is removed.